I am a bit behind on preparations for Rosh Hashanah (understatement), and I’m sure everyone who is preparing is also quite busy, so thank you for stopping by! Praiseworthy is a man who does not forget You (but his thoughts are constantly clinging to You), and (praiseworthy is) a man who truly puts his trust in You. For those who cling to You constantly, no evil will ever befall them, and those who trust in You will not be embarrassed forever, for the remembrance of all their actions will come before You (and their merits will avert embarrassment) and You will search their actions to find a merit so they will be found righteous in judgment. And the Talmud continues, telling us that he was right. On the following morning, he discovered that during the night, a Roman legion had attacked this village and taken its people as captives. Had he been accepted as a guest in one of these homes, he too, would have been taken captive. So, for me, the prayer from the Rosh Hashanah service teaches that if I work on being aware of and really trusting G-d, I will understand that even when “bad” things happen (like when I broke my foot several years ago), there is an ultimately good outcome (I learned to really, really appreciate being able to walk and do things without assistance). That’s a simple example. It can obviously be more complex when dealing with really tragic events, but the principle holds true. Wishing everyone a K’siva v’chasima Tovah (a good writing a sealing in the Book of Life). Have a wonderful New Year, full of blessings and good things!! 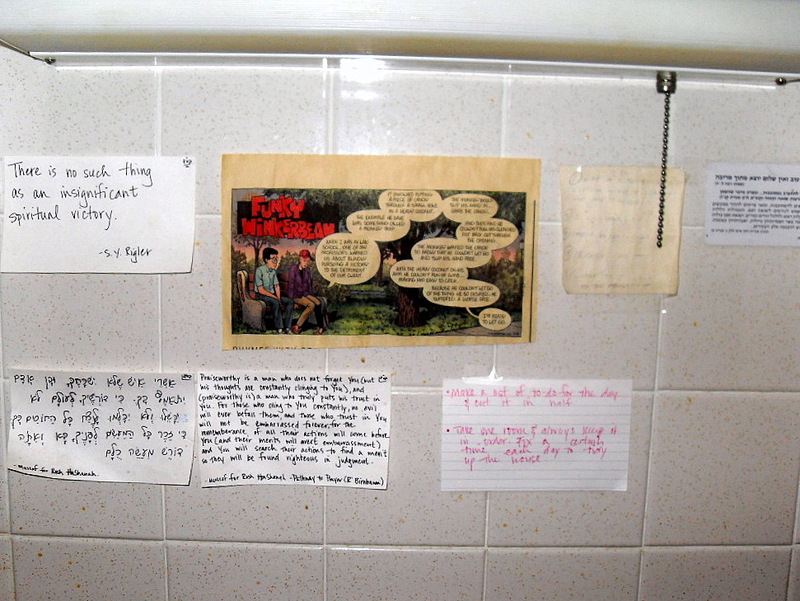 What a wonderful idea to have those quotes, etc., to look at and meditate on while doing dishes. You’re so right. There is so much to be gained by seeing even “bad” things that happen to us as something that can have a positive lesson or outcome. And btw, I’m also a collector of quotes and I think it’s a great idea to hang them in a place that you frequently will see. Thanks for the inspiration and may you have a Kesiva V’chasima Tovah! Thanks! Ksiva v’chasima tovah to you too! I love that story about Rabbi Akiva! And I have seen that same thing come true in my life many a time. Still I am happy to receive the reminder of it right now. Thanks for visiting my blog. I’m enjoying my look around as well!